Grout Flow Cone Sets - Gilson Co.
Grout Flow Cones measure the flowability of hydraulic grout used in preplaced aggregate concrete. Flowability is measured by time of discharge of a 1.725L sample of grout through the 0.5in (12.7mm) ID discharge tube orifice from the cone. Constructed of cast aluminum, the Grout Flow Cone has 7in (178mm) top ID and comes with an adjustable point gauge assembly to indicate initial sample level. 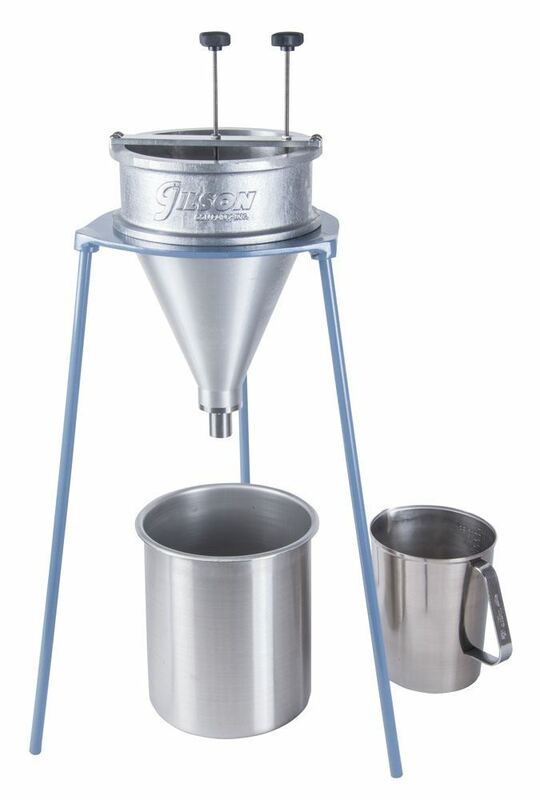 HM-372 Grout Flow Cone Set includes a Grout Flow Cone with replaceable 0.5in (12.5mm) Orifice, a 3-legged Steel Stand, and a 2L (2.1qt) Stainless Steel Beaker Receiving Container. This model only meets Standard ASTM C-939. HM-373 Grout Flow Cone Set is similar to the HM-372, except that the Grout Flow Cone is fitted with a special 0.75in (19mm) Orifice for less flowable grouts, and it does not meet ASTM C-939. Grout Flow Cones, Orifices and other set components are also available for purchase separately. Grout Flow Cone models include the point gauge measurement assembly and are available with or without 0.5in or 0.75in Orifices. Both Orifice sizes are replaceable and are also available separately. The sturdy painted Steel Stand is 20.5in (414mm) high. The 2qt (1.9L) Stainless Steel Beaker is sized to receive grout from a single test, and graduated in oz and cc. 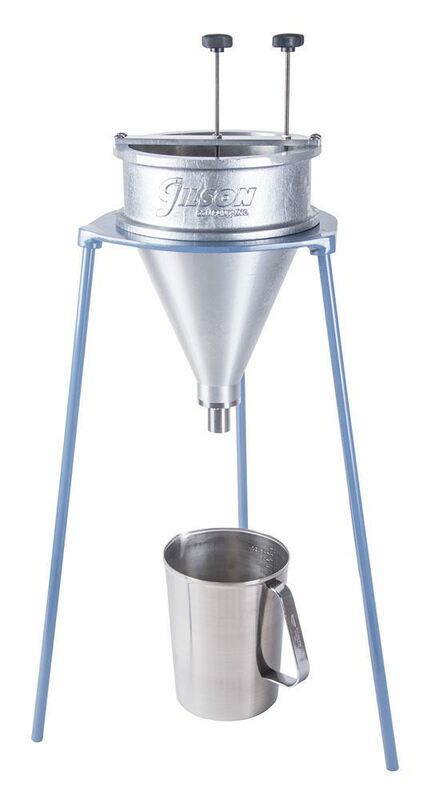 The 6qt (5.7L) Stainless Steel Beaker can collect grout from up to three tests. Orifices are available in two sizes, 0.5in (12.7mm) for testing flowable grouts or 0.75in (19.0mm) is best used for thicker grouts.